Disclaimer: Having recently interned at EcoPeace M.E. (NGO), the author wrote this article as a short overview of Ecopeace’s endeavor to foster ecological diplomacy. Trump’s decision to move the U.S. embassy in Israel from Tel Aviv to Jerusalem has revived tensions between Israelis and Palestinians, reinitiating a cycle of violence, revolt and repression in the area. Although it may be impossible to find a single straightforward answer to the Israeli-Palestinian conflict in the midst of such agitation, the most self-defeating idea remains to believe that no solution lies ahead and all hope is lost. While it is acknowledged that Israeli-occupied territories are a breach of international law and that Palestinians should enjoy full rights to self-determination within a two-state solution, this article is not a political statement in favor of one party within the Israeli-Palestinian conflict. Rather, this piece aims to shed light on the potential of ecological cooperation to foster dialogue and peace-building between two historically antagonist groups. Approximately 40% of all intrastate conflicts since 1950 had a connection to natural resources. While dispute over natural resources can trigger conflict, cooperation over such resources can also foster dialogue and improve diplomatic relations. Since 2005, direct provisions on natural resources have been included in all major peace agreements, which indicates an important shift towards ecological peace-building. In effect, the benefits (economic, health) which arise from efficient cooperative ecological management on high-value (timber, mineral, oil) and scarce livelihood resources (water, land) provide incentives for peace negotiations to evolve substantially. In the conflict-prone Levant region, water is the scarcest resource and water demand is continually rising. Hence, one of the most critical challenges for the region is to achieve water security. Many actors in civil society voice their concerns and work towards more cooperative and efficient resource management. For instance, as the only regional NGO with offices in Jordan, Israel and Palestine, EcoPeace M.E. is the most active when it comes to proposing sustainable solutions to the political and environmental realities that each country faces within the region. EcoPeace attempts to tackle this environmental plight both through bottom-up and top-down approaches. The bottom-up approach entails working with local communities, holding youth camps and managing peace parks, while the top-down approach relies on raising national/international awareness, formulating sound policies, and lobbying decision-makers to act towards greater ecological cooperation in the region. Considering the current lack of trust between Israel and Palestine, amplified by Trump’s lopsided diplomacy, pushing for an ecological and cooperative political agenda in the region is not an easy task. However, for any party to ignore or avoid the issue is to shoot oneself in the foot. 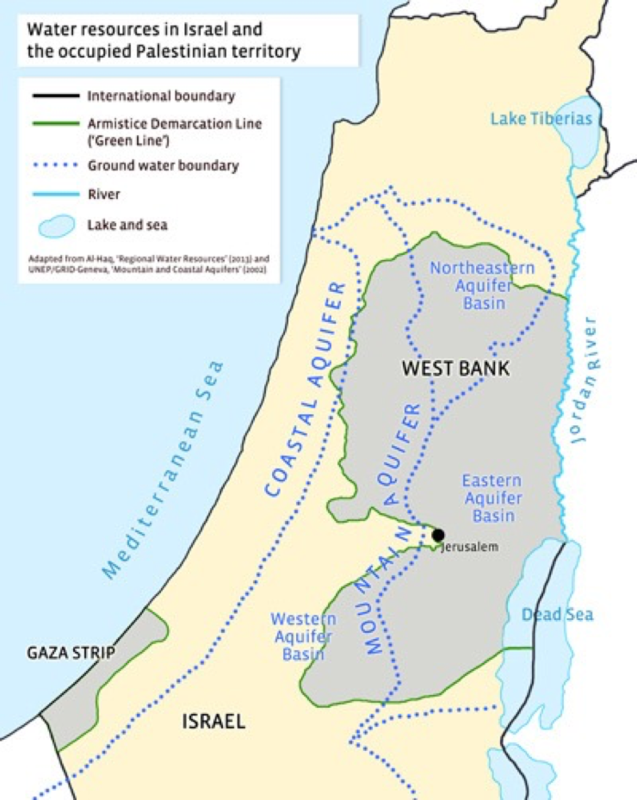 One must understand that Israel and Palestine share numerous water sources, including the Jordan river, the Dead Sea, and the Mountain and Coastal Aquifers. Hence, both countries are physically interdependent when it comes to utilizing those surface and groundwater basins. The Mountain and Coastal Aquifers are highly polluted due to over-extraction as well as seawater and sewage infiltration. Meanwhile, the Jordan River has seen 94% of its original flow diverted. The Jordan River being the Dead Sea’s main source of water, both are shrinking at an exponential rate. This situation affects all riparian states and cannot be dealt with individually by each side. As such, there is an urgency for all parties to sit around the negotiation table. 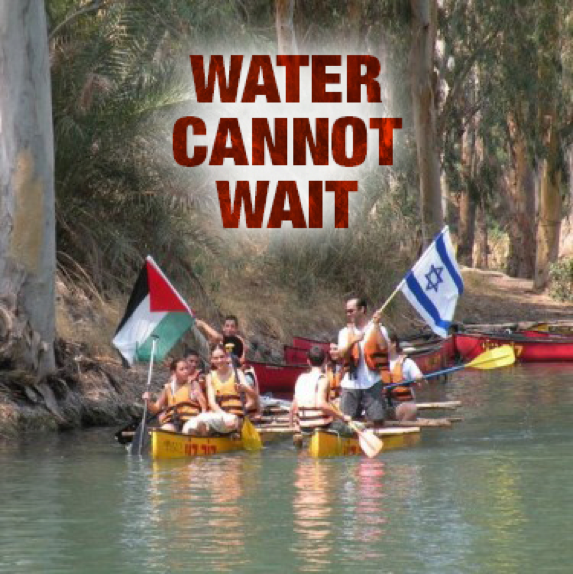 The urgency for an agreement is amplified by the ongoing water crisis in Gaza. Water pollution (97% of all water is unfit for human consumption) and the incapacity to treat wastewater because of electricity shortages in Gaza have led to a sanitation crisis. Poorly treated sewage infiltrates the Coastal Aquifer and flows into the Mediterranean on a daily basis. As a consequence, Israel had to shut down neighboring beaches (Zikim, Ashkelon National Park) and a five-year-old Palestinian boy died swimming off Gaza’s polluted coast. Today, it is in the self-interest of both Israel and Hamas to tackle the water issue in Gaza, as it is in the self-interest of all communities to tackle the issue of water at large. The main obstacle impeding Israeli-Palestinian negotiations on water has been an all-or-nothing approach towards a final status agreement. Since the 1993 Oslo peace process, environmental concerns within the region are held hostage to the incapacity of both parties to agree on more sensitive issues simultaneously (Jerusalem, borders and refugees). However, addressing the most urgent issues independently is the best solution to ease escalating tensions and build on successful agreements. Achieving water security in such a water-scarce area is a matter of national security and regional stability which can only benefit future negotiations. 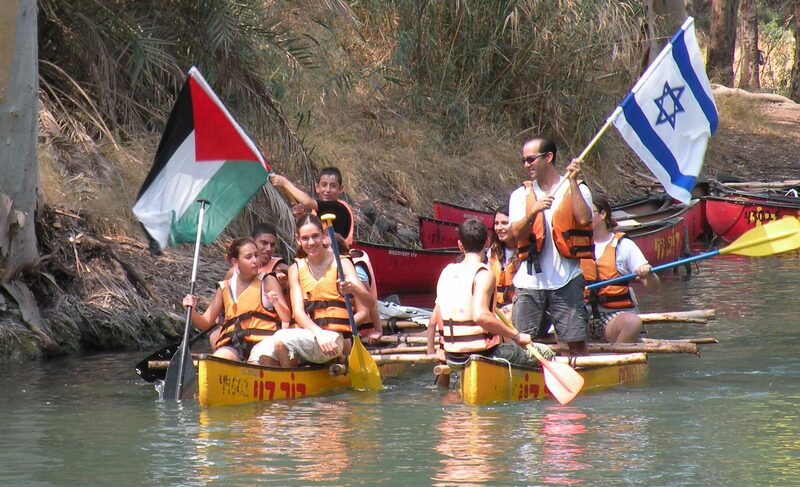 Because the livelihood of all first depends on secure and clean water sources, the effective management and an equitable allocation of natural shared waters between Israelis and Palestinians should be the first preoccupation of those aiming for durable peace. The environment may not only be worth preserving for its intrinsic value but also for the capacity it has to bring historically antagonistic parties together; there are multiple case studies to be drawn upon. In Northeast Asia, borderless air pollution and climate change are increasing political incentives for a “green détente” between North and South Korea. The Asian International Grid Connection project, which plans to utilize Mongolia’s Gobi Desert’s solar potential to increase ecological and economic cooperation in the region, is promising. In the Middle East, a similar project between Israel, Jordan and Palestine has seen the light. The Water Energy Nexus, formulated by EcoPeace, the Konrad Adenauer Stiftung and regional experts, emphasizes the benefits of a Jordanian, Palestinian and Israeli partnership over solar energy and desalinated water. The Water Energy Nexus aims to make all countries benefit from their respective advantages, namely Israeli expertise on seawater desalination and Jordanian desert solar power potential. The project’s endeavor is to create a healthy economic interdependency between Jordan, Israel and Palestine via the exchange of desalinated water for sustainable solar energy. This would increase water security, preserve the rich regional flora/fauna, limit increasing greenhouse gas emissions and foster greater political cooperation between all neighbors. During my internship at EcoPeace, I personally worked on formulating and editing Water Energy Nexus policies. I also designed Infographics, illustrating the main tenants of this project, which were used in Europe, the U.S. and the Middle East to attract public and private investors. While this project may seem out of reach under the present conditions, it may well be the most ambitious and sound attempt at fostering sustainability, economic integration and regional stability via ecological cooperation. Similarly to the way in which the European Coal and Steal Community of 1951 led to the peaceful economic integration of once-hostile parties, the Water Energy Nexus has the potential to solidify peace in the Levant by means of cooperation over natural resources. Knowing offshore gas was recently discovered in Israel, companies, investors and legislators have to make a choice between cooperation and isolationism, between fossil fuel and sustainable energy. Concrete ways towards cooperation and sustainability exist; it is now up to decision-makers to engage on those paths. Samy Graia graduated from McGill in May 2017 with a BA in Political Science, Middle Eastern Studies and Economics. He is currently taking a year off to harness work experience in the field of sustainable development before pursuing a Master’s degree. His main interests are conflict resolution, ecology, politics, fitness and hip-hop.